Here’s a marketing strategy that’s out of touch: Diamond retailer De Beers has announced it’s more than doubling its marketing spending this holiday season because they have “new research showing diamond jewelry will be the number one gift for the holidays in 2008.” Aren't we in a recession? I’m betting their research involved the Dear Santa lists of hopeful girls everywhere, and not interviews with their husbands and boyfriends. You know, the guys who are supposedly going to be buying all of these diamonds. Personally, I’ve given up hope that I’m going to get the diamond studs I’ve been dropping hints about. If you’re not lucky enough to find a diamond in your stocking this year, make yourself feel better with a flashy bauble that’s actually affordable. Emitations has fantastic cubic zirconia jewelry that look like several popular celeb styles. This pave CZ cocktail ring ($315) would be the perfect bling with your holiday LBD. J.Crew’s affordable and elegant jewelry is classy and versatile. This fireball necklace ($98) is an eye-catching mix of semi-precious beads and shimmery crystals. 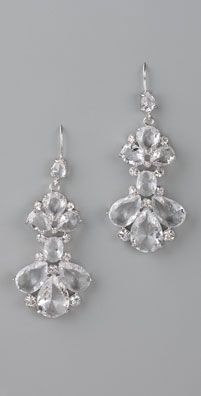 Lee Angel’s shoulder duster earrings ($94) with light-reflecting stones shine (almost) like the real thing and leave something in your wallet. Shop our Sold Out Guide for what will truly be flying off shelves this season.